Due giorni di corso & workshop “SHOW GROOMING” – speciale Rough Collie & Shetland Sheepdog- con MIA EJERSTAD “Steadlyn” a PRATO in Toscana – il 15-16 LUGLIO 2017. Il workshop sarà tenuto anche in lingua inglese in caso di partecipazione dall’estero. This workshop will be held also in English language in case of participation from abroad (read full text in English further down). Organizzato in collaborazione con il Gruppo Cinofilo Pratese. Due giornate intere dedicate alle razze Collie a pelo lungo e Shetland Sheepdog. Un workshop concentrato e completo, dove prepariamo i nostri cani alla perfezione. Le lezioni teoriche e le dimostrazioni sono mischiate con un workshop pratico dove i partecipanti lavorano con i propri cani. Consulenza individuale per ognuno e il suo cane/i suoi cani. Un corso aperto per tutti proprietari, espositori, allevatori e groomer, dove la teoria è fusa alla pratica. Possibilità di partecipare anche come uditore senza cane. Ogni partecipante riceve attestato e dispensa/materiale teorico. 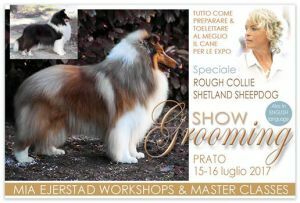 Two days of workshop/seminar ” SHOW GROOMING” – Rough Collies & Shetland Sheepdogs – held by MIA EJERSTAD “Steadlyn” in PRATO in Tuscany, Italy – 15-16 JULY 2017. This workshop will be held also in English language in case of participation from abroad. Organized in collaboration with the Gruppo Cinofilo Pratese. Two days dedicated to the Rough Collies & Shetland Sheepdog. A complete and very concentrated workshop where we will prepare our dogs to perfection. The lectures and demonstrations are mixed with a practical workshop with all participants and their own dogs. Individual counseling for everyone and his dog/her dogs. A seminar open to all owners, exhibitors and groomers, where the theory is fused into the practice. Possibility to participate also as auditor without dog. Each participants receive an attendance certificate and a manual.